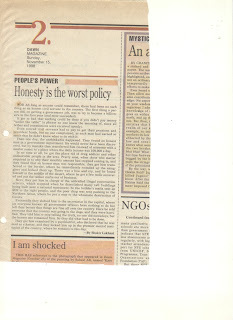 For as long as anyone could remember, there had been no such thing as an honest civil servant in the country. The first thing a person did, on gettting a government job, was to try to become a billionaire in the first year (and most succeeded). It got so bad that nothing could be done if you didn't pay any money "under the table" (a phrase no one knew the meaning of, since all bribes and commissions were received openly). Even retired civil servants had to pay to get their pensions and provident funds, but no one complained, as each man had earned so much that he didn't know what do do with it. Then one day, the unthinkable happened. They found an honest man in a government deparment. He would never have been discovered, but by mistake they transferred him (instead of someone with a similar name) to a place where the daily income was 100,000 a day. In no time at all, he got the place rid of drug addicts and other undesirable people in the area. Pretty soon, when those who matter enquired as to why their monthly amount had stopped coming in, and they found that an honest man was responsible, they got him transferred to the border, where he immediately rounded up the smugglers and locked them up. There was a hue and cry, and he found himself in the middle of the desert, where he got a few wells excavated and put the tanker mafia out of business. Next, they put him in charge of the unbridled illegal construction activity, which stopped when he demolished many tall buildings built near a national monument. So the builder's mafia sent an SOS to the right people, and the poor chap was sent packing to the Northern Areas, where he put a stop to the wholesale destruction of forests. Eventually they shifted him to to the secretariat in the capital, where (as everyone knows) all government officers have nothing to do but tell their bosses that things are fine all over the country. Here he told everyone that the country was going to the dogs, and they were horrified. They told him to stop telling the truth , no ond did nowadays, but the honest one remained firm. So they did what had to be done. They got him examined by a psychiatrist, who decared that he was mad as a hatter, and they locked him up in the premier mental institution of the country, where he remains to this day.